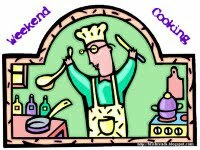 Weekend Cooking is a weekly event sponsored by Beth Fish. Anyone can participate and it is a lot of fun (plus a great way to find new recipes to add to a familiar repertoire). I know many of you know JoAnn of Lakeside Musing, but did you know that she and her daughter have started another blog devoted to cooking? It is called, appropriately, Lakeside Kitchen and I think it is great that two generations can work collaboratively on such a fun project. Last week they posted about some new cupcake cookbooks received and the impromptu purchase of a mini-muffin tin. I can’t tell you what memories this brought back for me! When we were still living in Connecticut (circa 1989), my husband was a branch manager for a local bank. One day he said that he would like to do something for his regular customers who drop in on Saturdays, but he wasn’t sure what. He thought maybe donut holes, but for some reason I piped up and suggested mini muffins. Well, that one suggestion provided about 5 years worth of Molly’s Muffins. If I didn’t bake muffins for the bank, I was baking them for women’s Bible study or some other social gathering. I would typically make about 3 different varieties each week, about 6 dozen of each variety (a double batch of each recipe). I think I had a rotating group of about 20 or so recipes, so that people wouldn’t eat the same muffin twice in one month. I thought it might be fun to post a couple of these recipes for this weekly meme over the next couple of Saturdays. Today’s recipe is actually a coffee cake of sorts. I am not sure where the recipe originated, as my mom made it while I was in high school and then I absconded with the recipe after I married. I adapted the measurements to suit the mini-muffin tins, but typically I make it in a 9×13 Pyrex dish. This is a very good, basic, rather bland cake that goes well with brunch fare, an elegant luncheon, or just a mid-afternoon snack with a cup of tea. I hope you enjoy it as much as my family has over the years. To remaining crumbs, add eggs, milk, soda, and spices. Mix well. Sprinkle half of the reserved crumbs (approximately 1 cup) on the bottom of the pan. Bake at 350 degrees for approximately 25-30 minutes – or until tests done. Yummy! That sounds delicious so early in the morning! Wow…five years! You are one dedicated baker. 🙂 Love muffins…I'd have done my banking on Saturday to get a couple…lol. If I had to bake that many muffins on a continual basis, I might go mad. Even though you call it bland, I have buttermilk in the fridge so I will ave to try thrm. Thanks so much for the shout-out, and I'm glad Margaret's mini-muffin tin triggered such wonderful memories! I was wondering if we overlapped time in CT, but I guess not… we left in July of 1988. The white gingerbread sounds delicious! I admire your five years of dedication. Actually, I bet it was fun and you probably learned a lot about baking. YUM! Will have to try your recipe. I loved baking mini-muffins (great for elementary school parties; my specialty was blueberry, but whose isn't?). And your story of baking for the bank reminds me of my mother, who made tea breads and Christmas cookies by the gross for my father to take to work, for her own colleagues, and her church. Homemade stuff is a powerful gift–I am sure that your efforts were as appreciated as they were delicious! Great, I love muffins! I will be looking out for your other muffin recipes, too! Oh, I love this. Looking forward to seeing more muffin recipes! I love muffins! This white gingerbread sounds so good. I found some very cute cookbooks at BEA. I have so much to highlight over the coming weeks.